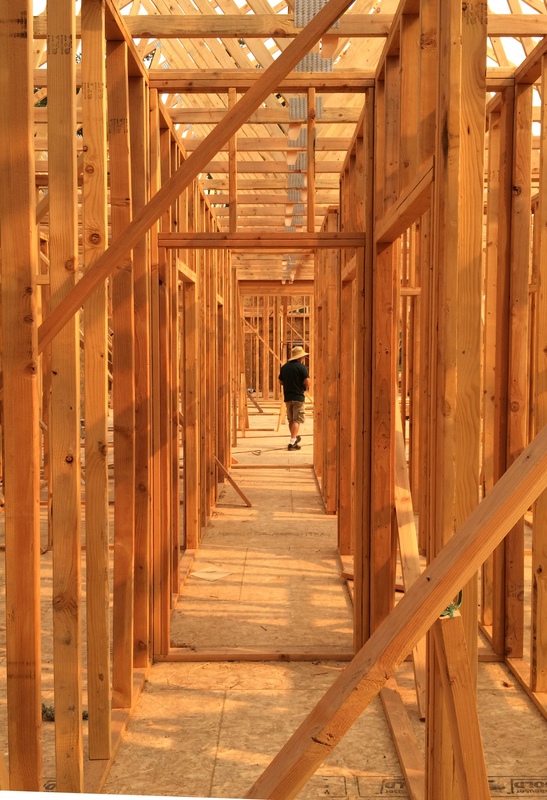 A few weeks ago we wrote about a new home just beginning construction. Here is an update! 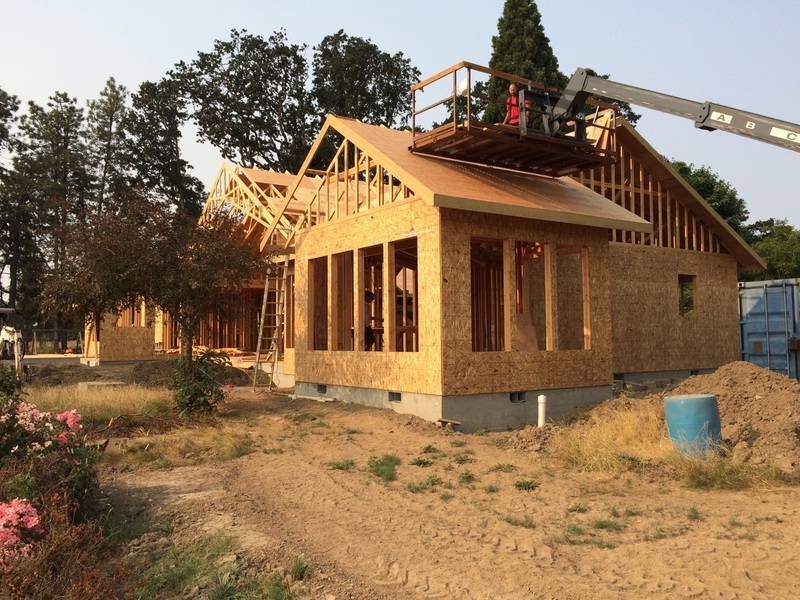 Framing has progressed steadily, and the shape of the house is coming into focus. 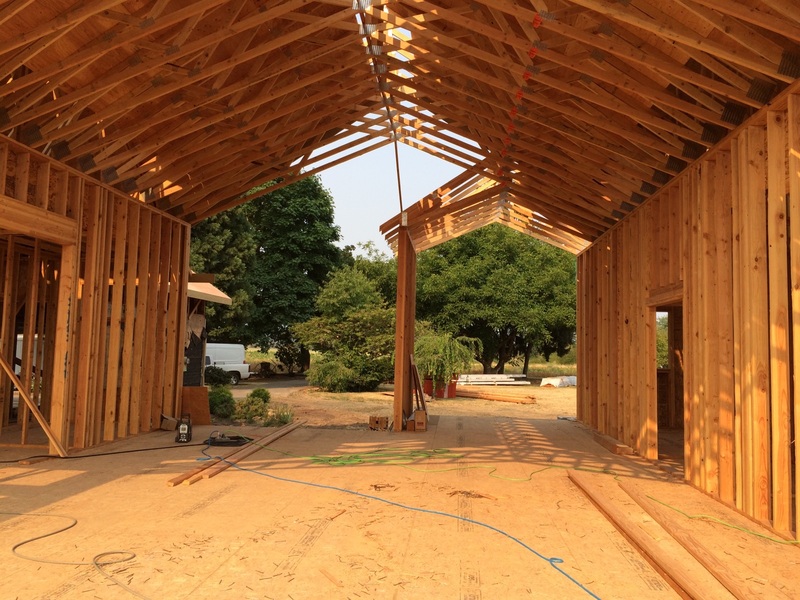 There is a certain beauty in the skeletal frame of a structure that we really enjoy. Below is a fish-eye panoramic view of the rear of the home. 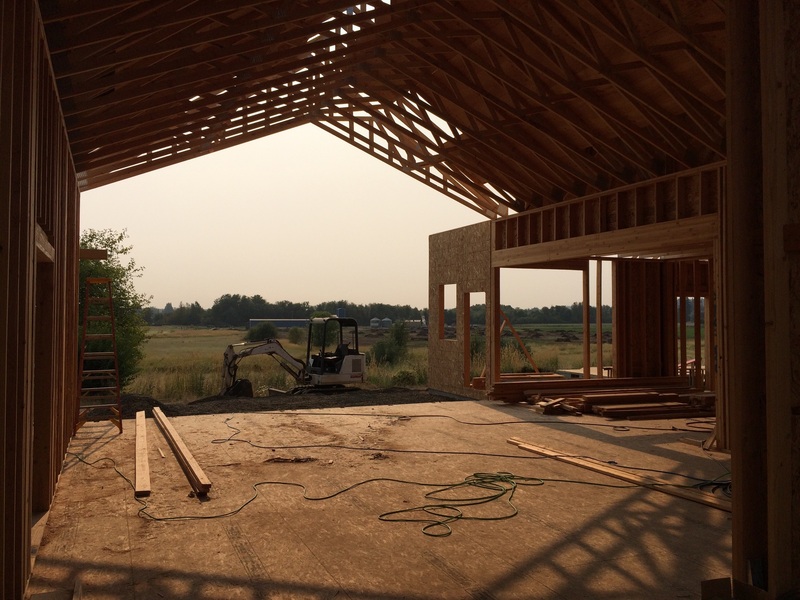 The den (in the foreground), breakfast nook, and covered back porch (to the right) have not yet been framed. The master suite is on the north side of the house and includes a private sitting room with views in three directions. A deck with a spa will be added outside soon! As guests walk through the front door, they will have a view through the living room toward the east and (on a clear day!) Mt. Jefferson rising above the clients’ meadow. A 16-foot-wide sliding glass door and transom will maximize views to the east. A breakfast nook to the right will provide both expansive views and lots of morning light. The picture below looks west through the living room, toward the dining area on the left and the entry on the right. The client has commissioned a large tile medallion for the entry floor. In this picture, Tom Powell is on site overseeing the work. This view is from the guest suite on the south end of the house, looking north toward the master suite. It provides a sense of the scale of the house. Framing of the den will begin soon. A computer-generated 3D rendering (below) allows the client to visualize the den design, including recent finish selections. The fireplace is a true masonry Rumford design, built from scratch! Walls will be paneled in cherry, and the windows and doors will be cherry as well. The upper library shelves will be accessible using a rolling ladder. (The ladder rail is visible in the model along the top shelf.) Cove lighting will illuminate the tongue-and-groove hemlock ceiling. We are very pleased with the progress, and we will continue to post more photos as construction continues!